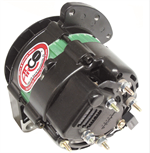 These alternators are direct replacements to those used on the original Chris Craft V8 engines. To place an order please use our secure online ordering. Call (267) 982-2192 or email (boatman@inetmarine.com) if you have questions about a product or need help placing an order.